She described a mass killing at a bakery called Al-Zarra in the Qadi Askar neighbourhood in Aleppo. I’d been working clandestinely inside Syria for four weeks, investigating violations of humanitarian law by both sides to the conflict – my third trip inside Syria in 18 months documenting egregious abuses committed by Syrian government forces. Still, I found it hard to believe. Bakeries? Bread lines? What could the government possibly want to achieve by attacking people queuing to get bread for their families? 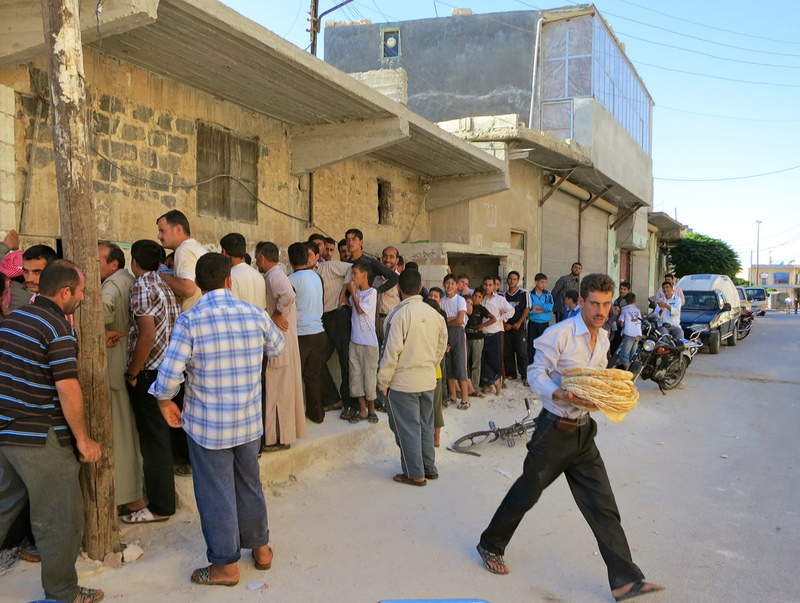 In war-torn Aleppo and the surrounding countryside, bakeries are the only places where one can see crowds of people. Most of the time, residents stay inside, hiding from the artillery and aerial attacks that, over the last month, have become a daily routine. But acute shortages of bread in opposition-controlled areas force them out of their houses at the crack of dawn or late at night – whenever a bakery finally gets supplies and opens. An attack on a simple bread line sounded too shocking. We had to conduct a thorough investigation to determine what happened, and we started at the Al-Zarra bakery. The bakery was open, despite the earlier attack. There were hundreds of men and boys in front of the bakery when we arrived, and women were queuing inside. We quickly found witnesses who were there at the time of the attack on August 16. They told us that at about 5:45am that day, one or two artillery shells hit the square near one of the Free Syrian Army (FSA) bases in the neighbourhood, about 150 meters from the bakery. The shell caused no damage to the facility or casualties among FSA members. Fifteen minutes later, three more shells hit the area within a few minutes, each hit successively closer to the bakery. The third shell hit the street a few meters from the bakery, spraying shrapnel into the line of people. It was one of the most lethal incidents we have documented in Aleppo, but it was still too early to draw conclusions. In the following days, however, we documented in detail five other attacks on bakeries in Aleppo city and the nearby countryside, and collected credible information about four more. In all of the cases, with one exception, government forces attacked the bakeries when local residents were waiting in line. We examined the craters and remnants of the ammunition. It was clear that the ordnance—artillery shells, rockets, and bombs—hit very close to the lines, killing and seriously wounding scores of people. In a few cases, people waiting in line heard approaching fighter jets and were able to run away before the attacks, witnessing them unfold. All of the 10 bakeries were in neighbourhoods or towns where no fighting was taking place before or during the attacks. 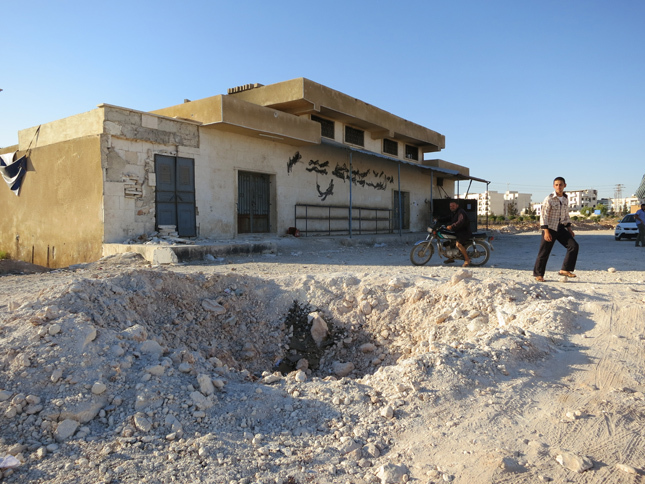 The Al-Zarra bakery attack was the only case in which an FSA facility was located in the vicinity; in all the other cases we documented, there were no military targets in the area apart from some FSA fighters assisting with bread distribution. Several videos taken by witnesses in the aftermath of the attacks corroborated their statements with shocking clarity. Ahmed (name changed), a 17-year-old who barely escaped an attack on Aqyoul bakery in the Bab al-Hadid neighbourhood in Aleppo on August 21, said he first saw a helicopter circling above the area that day and started filming. He saw the helicopter drop a bomb and ran for cover, then continued filming as soon as the helicopter left. He was too shaken to describe what he saw and just handed me his camera. It was one of the most horrific scenes I have ever watched: The camera moves slowly over a long line of people who are either dead or heavily injured, right along the wall of the bakery where they had been waiting for bread. Many more bodies, some with limbs and heads blown off, can be seen on the ground around the bakery. There could be no mistake: The hits were at least recklessly indiscriminate, and the pattern and number of attacks strongly suggest that government forces have been targeting civilians. It is the first time that we can say with confidence that we’ve found evidence suggesting deliberate aerial and artillery attacks targeting civilians, and it indicates that the conflict has entered a new phase. Unable to stop the advances of the Free Syrian Army throughout the country, Syrian forces appear to have resorted to the most deplorable tactics: killing and terrorizing the civilian population. When a government no longer makes any effort to distinguish between combatants and civilians – when it kills men, women, and children who take no part in hostilities – it is usually a sign of despair. But it should also be a final wake-up call for those in the international community who are still treating the Syrian government as a legitimate partner. Meanwhile, every day of indulgence adds hundreds of new names to casualty lists at places like the Dar Al-Shifa hospital. Anna Neistat is associate director for Emergencies Division at Human Rights Watch. She has made nearly a dozen trips to the region since the Syrian conflict began. An expert in humanitarian crises, she has also worked recently in Yemen, Bahrain, Algeria, Afghanistan, Pakistan and Georgia. Neistat holds an LL.M. degree from Harvard Law School, a J.D. and Ph.D. in law, and an M.S. in history and philology.